Walking provides unquestionable health benefits, so it’s an excellent way to get where you want to go. Regular walking can burn off excess calories, improve your cholesterol levels, lower your blood pressure, and, as a bonus, you’ll probably be in a better mood when your walk is over. As good as it is, however, walking a mile per day probably isn’t enough. Walking can easily be the foundation of your exercise program, but you’ll have to do a bit better than a mile a day to stay in top shape. 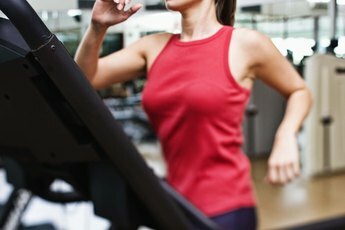 The Centers for Disease Control and Prevention recommends that adults perform 150 minutes of moderate-intensity exercise each week, plus two days of strength-training activities. You can certainly fulfill the 150-minute aspect of the CDC guidelines by walking daily, but you’ll probably have to walk farther than one mile per day. The 150-minute requirement equals about 21 1/2 minutes per day. That means you’ll travel a bit slower than 3 mph to complete your daily mile. Unless your route has plenty of hills, that’s not really a brisk pace. Brisk walkers travel about 3.5 to 4 mph, according to the “Berkeley Wellness Letter.” So even without considering the strength-training requirement, walking a mile a day doesn’t provide sufficient weekly exercise, according to the CDC guidelines. Even if a daily one-mile walk isn’t sufficient exercise on its own, the walk still offers some benefits. 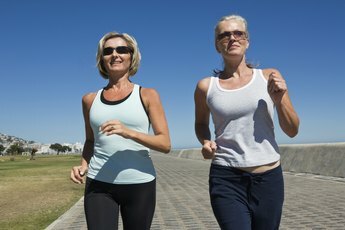 A study of close to 40,000 women cited in the “Berkeley Wellness Letter” noted that even one hour of walking per week reduced the participants’ risk of coronary artery disease. 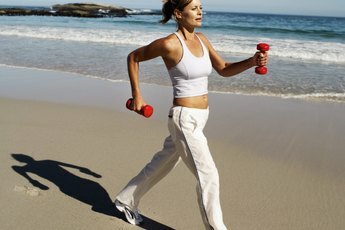 Additionally, a 155-pound person walking at a brisk pace of 4 mph will burn about 167 calories in 30 minutes. Walking a mile at 4 mph takes 15 minutes, so you’ll burn about 83.5 calories. That may not seem like much, but every little bit adds up, especially if walking is just a part of a larger program. Unless your path is icy, walking is typically a safe, low-impact exercise. But you should still take some safety precautions. Buy quality walking shoes that support your arch and heel to absorb the shock of all those steps. Dress appropriately for the weather: Layer your clothing if you’re walking in the cold, rather than wearing bulky jackets. Use sunscreen if the sun is out, even in the winter. 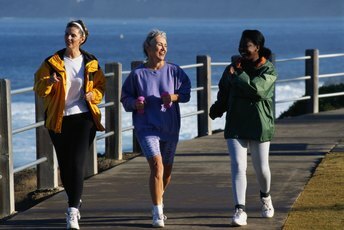 Walk slowly for several minutes to warm your muscles at the start of each session. Better still, perform a dedicated warm-up that’s not part of your daily mile. Walk slowly or do another form of light aerobic exercise for about five minutes, then do some dynamic stretches, such as leg kicks, walking lunges or walking with high knees. Intensify your daily walk by swinging your arms in sync with your strides. Bring your hand in front of your chest as you stride forward with the opposite foot, then swing your arm back to your rear hip. The jury is out on whether hand weights offer greater benefits than risks. If you carry hand weights while you walk, limit them to 3 pounds or less. Try to walk on a rolling or hilly terrain, which adds intensity every time you move against gravity. Walking on a soft surface, such as sand, also ramps up the intensity. If you must walk on flat terrain, try adding some higher-intensity intervals by moving more briskly for brief periods within your one-mile excursion. What Are the Benefits of Walking for the Intestinal Tract? Does Walking Backward Strengthen Your Hamstrings?